Oven-baked Chicken Kievs made from fresh, not frozen meat but with the same delicious garlic butter juices and extra crunchy coating. Ready to eat in 30 minutes. 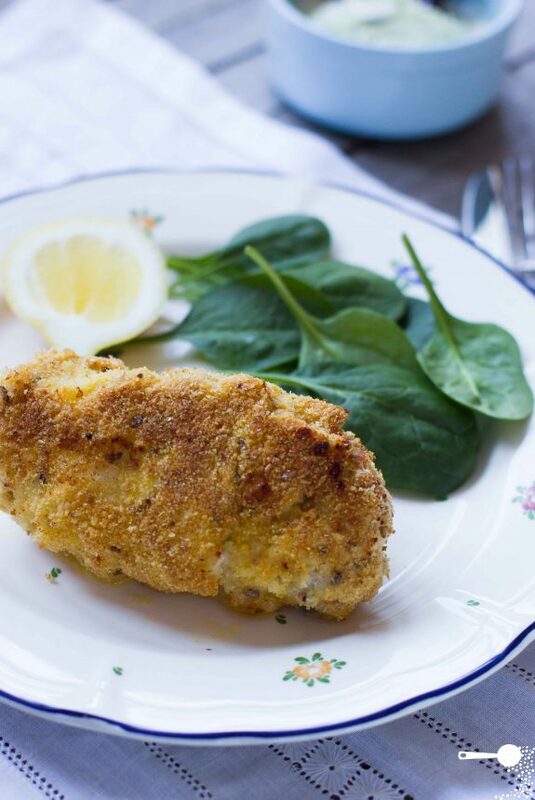 My oven-baked version of the Kievs is quite simple really and can be easily adapted for gluten and dairy allergies. 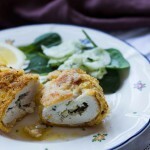 Most traditional recipes ask that you freeze the rolled up chicken breasts before coating and deep frying. Frankly, who has the time nowadays, and unless you are prepping them for dinner the week coming, I suggest making them fresh. 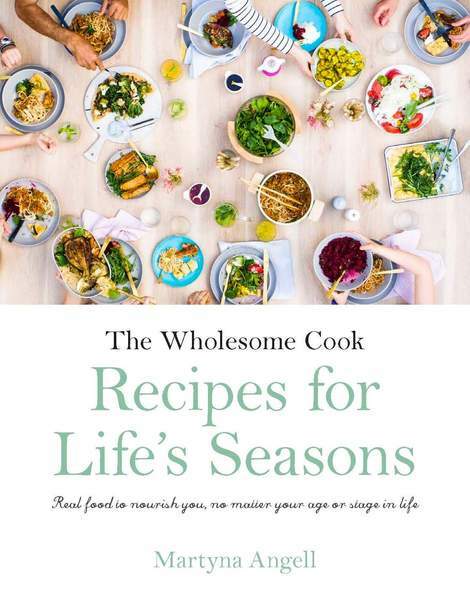 And whichever breadcrumbs you choose – sourdough, multigrain or even gluten-free, do yourself a favour: double coat the Kievs. There’s something magical about the thick crunchy skin on that chicken. Now, the trick to securing the juices inside the Kiev without pre-freezing, and aside from the double coating which helps, is to use toothpicks; 2–3 per roll. Remove just before serving. I missed one so Mr Chipconnoisseur got a bit of a fright. As for the Cucumber Salad, it’s one of the most refreshing, spring-smelling salads I know. 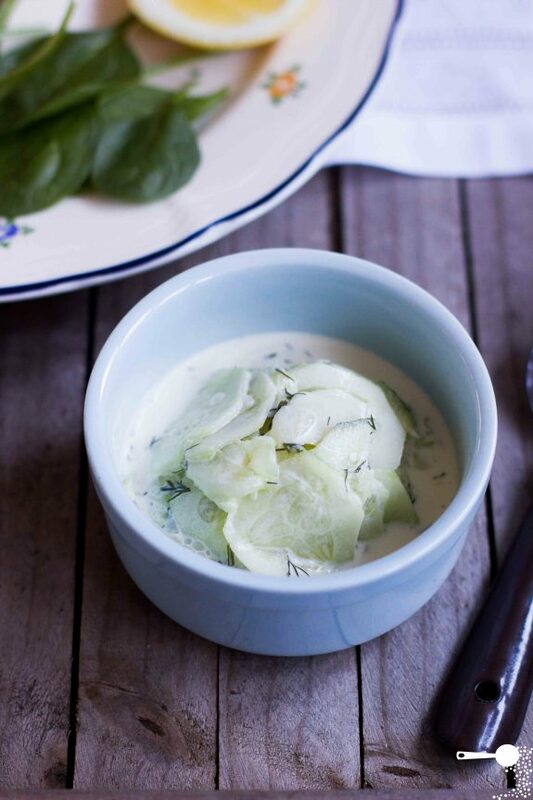 4 simple ingredients: cucumbers, salt, cream and dill. And in my own version, some baby spinach leaves as well. Not much can beat that. 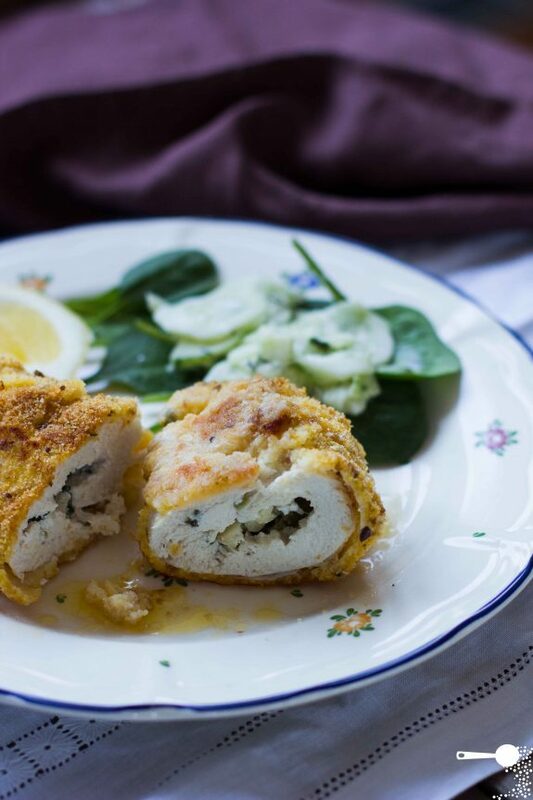 Chicken Kievs made from fresh, not frozen meat but with the same delicious garlic butter juices and extra crunchy coating. Ready to eat in 30 minutes. Butterfly the chicken breasts - using a sharp knife cut the breast almost in half horizontally. Open up, you should have one heart-shaped piece. Tip: cover chicken with a sheet of cling film to avoid bits flying around. Flatten the breats to a uniform thickness of about 0.5cm (1/4in) with a meat tenderiser. Working from the wider side, place half the butter and garlic into the middle of each breast. Now roll up each breast tighly, folding in the sides a little. Secure sides and middle flap with toothpicks. Whisk together egg and melted butter. 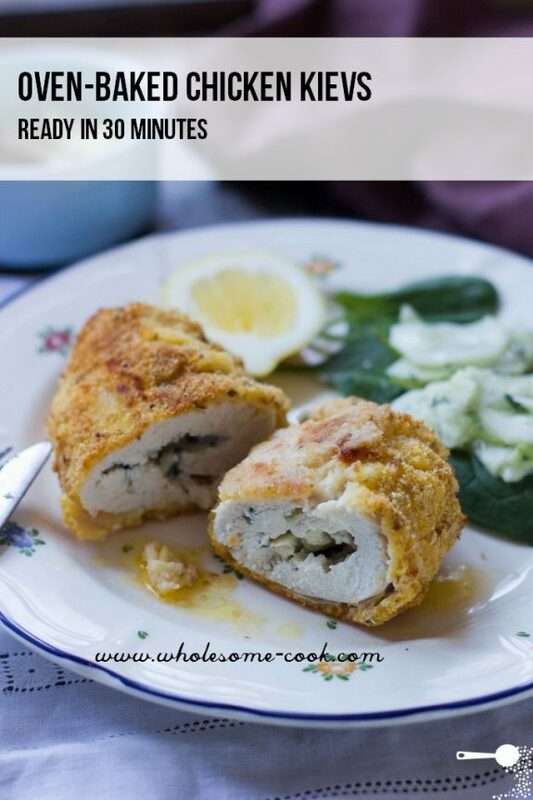 Roll each Chicken Kiev in the egg until evenly coated. Dip into breadcrumbs and roll until coated. Repeat the process one more time for each Kiev. Place crumbed Kievs on a baking tray and bake on the top shelf of a pre-heated oven for 20 minutes, turning over half way through. Place sliced cucumber and salt in a bowl. Mix well and refrigerate for 10 minutes. Add cream and dill then mix well. Lastly, add spinach leaves and mix again. I am always tempted to buy the frozen ones but I’ve read the labels. So much better your way. Salad sounds nice too! It’s like a much better version of schitzel, isn’t it? This looks fantastic Maureen. I especially love the cucumber salad. Cucumber salads are always popular in our house. Martyna, Yum! Although the cream in the cucumber salad seems indulgent for a regular family dinner. I have a half cucumber in the fridge (leftover from your yummy sweet’n sour pork with Anathoth tomato relish recipe) which I would love to use to try this salad. Is there an alternative to cream you couold reocmmend? Hi Danielle, we had the Sweet and Sour Pork on Friday night! Snap! As for the salad, you could just use full cream milk or Carnation light and creamy evaporated milk, adding perhaps a little less if you like. Hi the ingredient list has parsley but I can’t see it being used in the recipe. Do we add it to he butter and garlic mixture? Yes, sorry! I must have missed that! Do you have directions if I make ahead and freeze them? Bake from frozen at 350 for 50 minutes?